Mega Man X: Hard Type is a rebalance and stage redesign project for Megaman X for the SNES. Within its objective is to enhance the difficulty to provide a fresh new experience to veterans of the platform genre. Mega Man X: Soft Type is a patch included in the download, which features all of the changes listed below, except for the level redesigns. It's a must for players who want to check out a rebalanced verison of the original, without having to play the redesign stages! 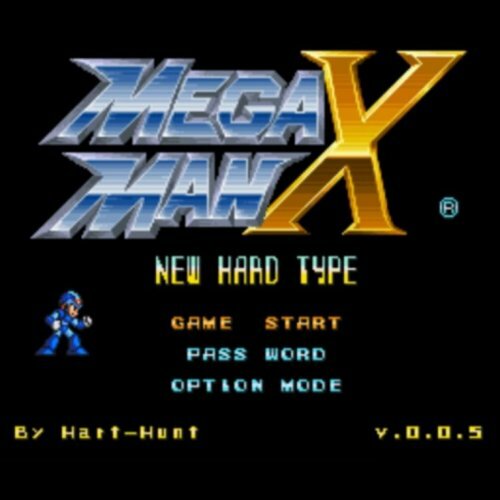 Think of it as a middle ground between the original, and MMX: Hard Type! Level changes: Every single level has been redesigned from scratch, including bosses arenas. AI changes: Regular enemies, bosses and minibosses have had their AI enhanced, making them more responsive and faster, among other things. Enemy stat rebalances: Enemies have had their HP rebalanced and they usually deal more damage. Player stat rebalances: Ammo has been reduced, and each of the weapon's costs have been rebalanced. Damage done by weapons have been rebalanced as well (The Hadouken isn't a 1-shot anymore), both against regular enemies and bosses. Some weapons had their speed rebalanced. The body upgrade has been nerfed to 25% damage reduction. Infinite lives. Dialogue changes. Spec mode modified. Death counter in the pause screen. Each of the bosses can now be rebattled. Each of the Maverick stages can be exited without having beaten it first. Hadouken capsule only requires 1 visit. Doesn't require all stages beaten. Dash acquired after completing the Intro Stage. Custom Title. Other rebalances and small additions. X starts the game with dash enabled. Leg Upgrade allows for higher jump height, and decreased wall slide speed. When combined with the Arm Upgrade, it also allows for faster ladder climbing. Head Upgrade recovers half of a SubTank's capacity each die X dies. Body Upgrade now only reduces 25% of incoming damage. Arm Upgrade functions the same as the original: Enables third level charge of the buster and allows for special weapons charging. Hadouken is not longer a 1-shot and it's easier to fire / land. Details to come. Zero gives an upgrade to X after the Vile battle. No spoilers. Other gameplay rebalances. X gets a SubTank for every 2 SubTank Pieces. By grabbing all 4 SubTank Pieces, you get 2 SubTanks total. SubTank Piece Counter added in the pause screen. Infinite Lives. Death Counter up to 999 added in the pause screen. Weapon speeds get rebalanced. Weapon damage gets rebalanced. Weapon usage cost gets rebalanced. Duration of Sting Chameleon's charged attack gets rebalanced (Yes, I typed that separatedly). Invincible frames after hit are slightly reduced (emphasis on the word slightly). Health drop rates are unchanged. "Spec Mode" (Little button in the bottom left in the Select Stage screen) now includes difficulty labels for all stages, so the player can pick a stage with the difficulty they want most. They also include the upgrades in the stage as well. Stages can be exited at any given time, with no need to beat them first. Only notable exception is Highway Stage (since it's the Intro Stage). Enemies get their fair rebalance, as well. Enemies get faster and more reactive. Enemies deal more damage. Enemies are more grouped and better synergized. Enemies drink your tears. Want to donate? Click here! Patch must be applied to a Mega Man X2 (U), UNHEADERED ROM . 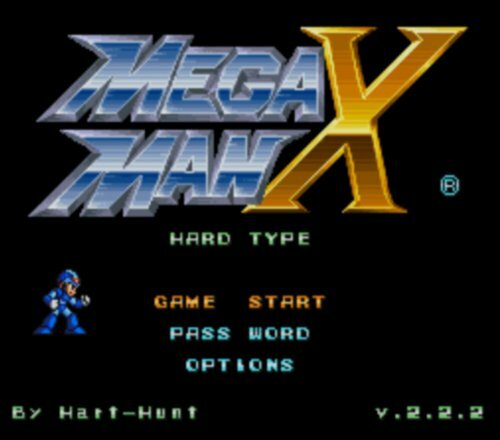 Mega Man X2: New Hard Type is a WIP project - rebalance and stage redesign project for Megaman X2 for the SNES. Within its objective is to enhance the difficulty to provide a fresh new experience to veterans of the platform genre. Note that this is an Alpha release. 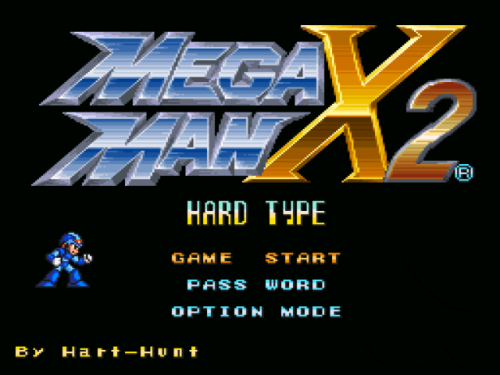 Further development of X2 will be done after its sister project, Mega Man X: New Hard Type gets to its final version.